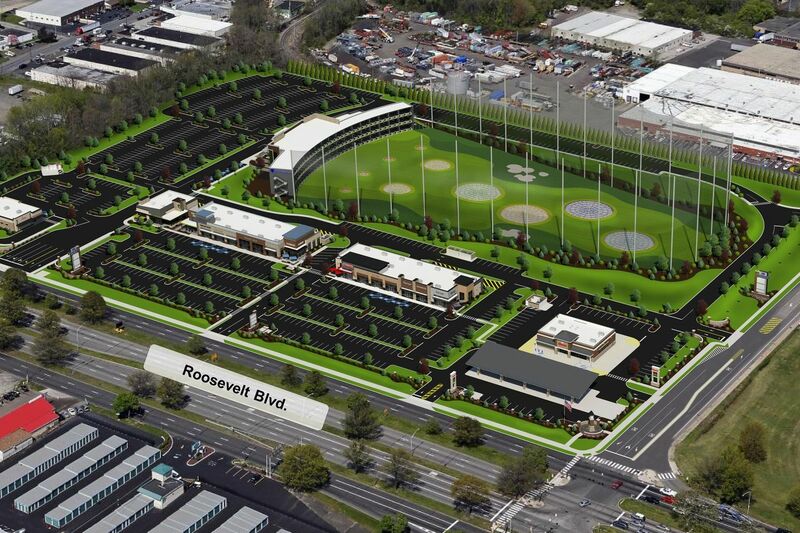 The owner of the former Nabisco plant in Northeast Philadelphia has a deal with Topgolf International Inc. for the company to build one of its golf-themed entertainment complexes at the Roosevelt Boulevard and Byberry Road site. Michael Cooley, vice president of site owner Provco Group’s real estate division, told members of the Somerton Civic Association Tuesday that Topgolf plans to spend up to $40 million on the 60,000- to 70,000-square-foot facility, according to Skip Montell, the community association’s treasurer. Cooley appeared before the group to seek support for land-use variances needed for the project, Montell said Friday. Most residents supported the proposal, he said. Provco, which is based in Villanova, hopes to begin construction in September once the former factory site’s remaining buildings are cleared, so that the golf facility can open in 2020, residents were told. The project is also to include strip-retail structures that will accommodate a branch of the Chipotle restaurant chain, and other tenants, Montell said. Provco and MCB Real Estate of Baltimore paid $10.2 million in 2016 for the 27.5-acre property at 12000 Roosevelt Blvd. The facility had been owned by Mondelez International Inc., which operated the site as a baking and distribution center for Nabisco, Oreo, Cadbury, and other brands. A Wawa convenience store has since been built on part of the site. Currently, Topgolf’s closest location to Philadelphia is in Mount Laurel. Topgolf venues feature partially indoor driving ranges and sports-bar-style dining. Topgolf spokesperson Morgan Schaaf said in response to an emailed request for more details Friday that the company is “working to bring another venue to greater Philadelphia” but has no further information to share. Cooley was not immediately available to discuss the plans. Wolf Commercial Real Estate, a full-service CORFAC International brokerage and advisory firm, is a premier Philadelphia commercial real estate brokerage firm that provides a full range of Philadelphia commercial real estate listings and services, property management services, and marketing commercial offices, medical properties, industrial properties, land properties, retail buildings and other Philadelphia commercial properties for buyers, tenants, investors and sellers. Wolf Commercial Real Estate, a Philadelphia commercial real estate broker with expertise in Philadelphia commercial real estate listings, provides unparalleled expertise in matching companies and individuals seeking new Philly retail space with the Philadelphia commercial properties that best meets their needs. As experts in Philadelphia commercial real estate listings and services, the team at our Philadelphia commercial real estate brokerage firm provides ongoing detailed information about Philadelphia commercial properties to our clients and prospects to help them achieve their real estate goals. If you are looking for Philly retail space for sale or lease, Wolf Commercial Real Estate is the Philadelphia commercial real estate broker you need — a strategic partner who is fully invested in your long-term growth and success.